When reporting a tricky bug, it is mandatory for us to get a sample of a report that shows the bad behaviour. The worst bugs are bugs that consistently show up at the customer’s system but refuse to be seen on my own computer. The best bug-reports are reports that contain a small sample report along with the data necessary to show the bug’s effects. However, not everyone is willing or allowed to share sensitive data. If the bug occurs in your HR reports, its probably not the best idea to attach the report and data to a public JIRA case. When you live in the EU, disclosing personal data of non-consenting persons is a rather serious act. With Pentaho Reporting 4.0 creating good bug-reports finally becomes easier. Select “Extras->Anonymize Report” and your report’s text goes through a randomization process. All characters in the labels are replaced by a randomly chosen character, while preserving both word length, punctuation and capitalization. The select the report’s query and select “Extras->Anonymize Query” and your data undergoes the same process. Numbers stay numbers, but are replaced by randomly chosen numbers of the same magnitude. Text and dates are scrambled too. 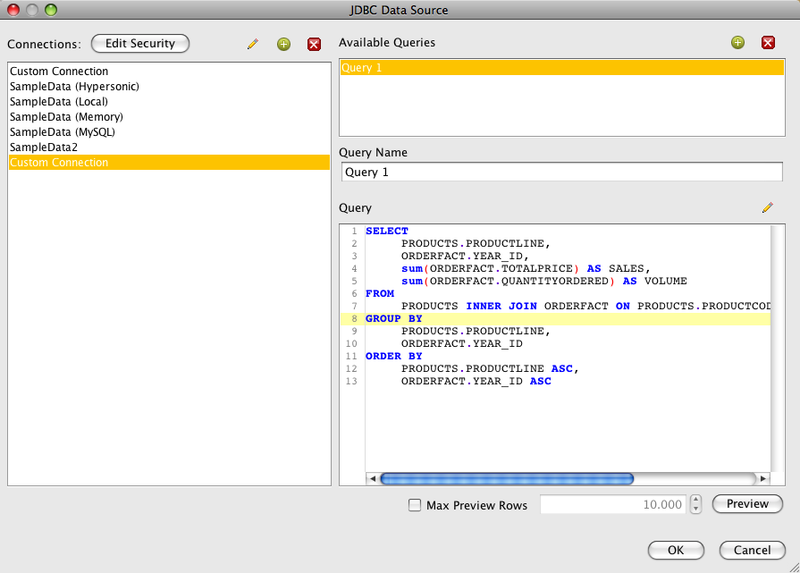 Once this is finished, remove your old query from your data-source and your report now uses the new query. Note that the query-anonymization works on the preview data. If your query has parameters the preview usually does not return data without proper parameter values. In that case you need to rewrite your query to remove the parameters before you can anonymize it. With this selective process we preserve most of the characteristics of the report that are important for the layout calculation, but remove most of the sensitive data that was contained in the report. This entry was posted in Basic Topic, Tech-Tips on May 22, 2013 by Thomas. When you create reports connected with each other by links, you want to stay in the same output mode as your source report. When viewing a PDF report, you want the linked report to be PDF too, for instance. So how would you do that in Pentaho Reporting? (1) You need to know your current export type. * .. and so on. The BI-Server uses the same identifiers in the reporting plugin to select the correct output target for your reports. The parameter for this is called “output-target” and is documented in the Pentaho Wiki. You probably know about the “ISEXPORTTYPE” function. This formula function allows you to test for a specific output target when the report runs. To get the export type you now could write a ugly long formula with many nested IF functions. to get the export descriptor string directly. (2) You need to feed this export identifier into your links. Use the Drill-Linking functionality to add a manual parameter to your link. Name this parameter “output-target” and link this to your BSH-Function. If your function is named “ExportType”, then you would write “=[ExportType]” into the value field. With that connection made, your reports will now be linked with the same output-target as the source report. Set the “Hide Parameter UI” option if you want to link against the target file without having to manually submit parameter. This entry was posted in Basic Topic, Parameter on March 12, 2012 by Thomas. One of these bugs I had in my bucket for the last week was a rather nasty error condition on reports with a large number of rows. Reports like that are usually used either for data exports or for performance tests, as a human user barely reads the first sentences of an e-mail, not to speak of hundreds of pages of dull numbers. 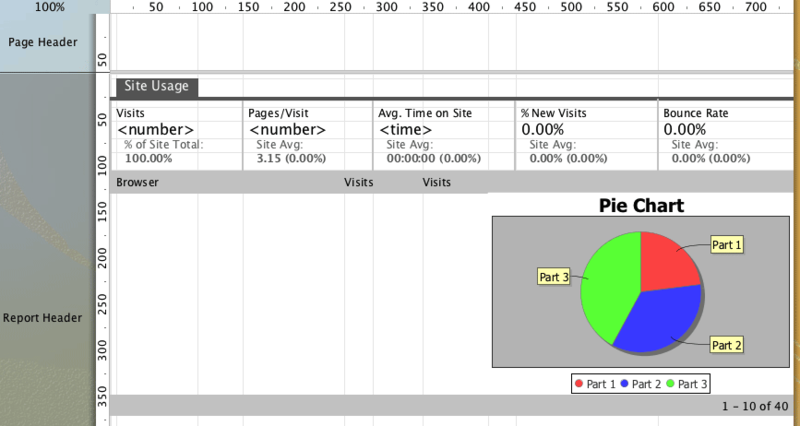 Reports with large numbers of rows were incredible slow when run as Excel/HTML/RTF/Table-CSV or Table-XML export. The slow down was worse the more rows were in the report. Short version: The iterative processing in the reporting engine was broken and resulted in a increasingly large layout tree. Iterating this tree to calculate the layout gets more and more expensive the larger the tree gets. 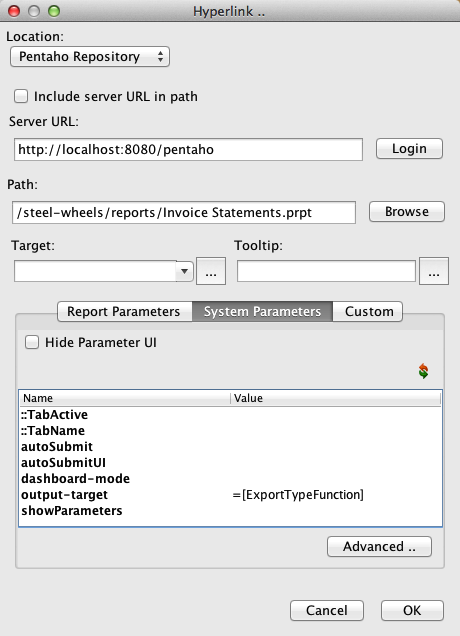 The Pentaho reporting engine uses an iterative layouting engine to process the report. During the layouting stage we build up a layouting-DOM tree containing the various boxes and content that makes up a report. Our model is heavily inspired by the CSS specification and is optimized towards using as little memory as possible. Boxes get added to the layouter by the reporting (data processing) engine and once the layout reaches a stable intermediate state, the content is printed and the processed boxes get removed from the layout-DOM. This results in a sliding zone of activity on the layout model and allows us to process huge reports with minimal memory footprint. And we don’t even have to swap to disk for this – all processing happens in memory. To make this model work, we have to track which layout nodes that have been processed already and which nodes could still move around in the final document. The whole process of tagging finished nodes worked nicely for paginated reports, but failed for flow- and stream-layouted reports. The system never tagged nodes as ready for print, and so the layout tree grew bigger and bigger. At the end, this resulted in larger processing times (as the iteration of the tree took longer) and a huge memory foot-print (as more nodes have to be held in memory). To fix this problem, I had to fix the “ready-for-process” tagging [SVN]. Once the iterative process sprung to life, the memory foot-print went down, but the processing performance was not as good as I would have expected. In fact, the iterative processing worked so well, that it caused more overhead than it actually saved time. A quick and dirty throttling of the layouter’s processing queue made performance jump up. We now only process every 50th iterative event, and thus trading a bit more memory costs for a huge increase in processing speed. When can I get this fix? The fix will be included in the 3.8.2-GA release and should be built within the next weeks. At the moment, everyone at Pentaho is still busy finalizing the BI-Server 4.0/PRD-3.8.1 release, so it will take a moment before we can fire up another release. In the meantime, you can either grab the sources from the Subversion repository or grab the CI-build. The 3.8.2 engine is a direct replacement of the 3.8.1 build, so you can patch your system by just copying the final jar-files over. I have not tested whether you can do some similar patching with 3.8 or 3.7 installations. This entry was posted in Basic Topic on August 25, 2011 by Thomas. I got a e-mail earlier this week, asking for some help in migrating reports. compressed files, not an archive of files. have to create and open these bad boys. Like>  prpt-replace –dbConnectionHost "192.168.1.100" "mydb.mycorporation.com"
Well, hard-coding database connection information in every report is never a good idea in no environment. If your database host or credentials changes you are truly and well .. in trouble. So how can you avoid this trouble in the first place? JDNI is a technique to hold database connections outside of the report definition. By holding this information in a central spot, you only have to change one place and all your reports get updated. The JNDI stored connection information is stored on the computer where your report runs. This also allows you to have separate definitions based on where the report runs. Your report designer can access a local copy of your production database, while your production server uses the real database server. As a side note: On the BI-Server, this system of abstracting database information is called “Pentaho Datasources”, not JNDI. In this posting, I will forgo the branding exercise and simply continue to call it JNDI. For all of your production reports, you should always choose JNDI defined datasources. Manually defined datasources are great for testing out ideas, but really a nightmare to maintain and by storing the database credentials they potentially pose a security risk if you choose to share report definitions with others. driver: The name of the driver JDBC class. url: The JDBC URL. This URL contains all information needed to connect to the database like the host name and port. The format of this URL is specific to a particular database. Consult your database manual for details on your particular database. user: The username for the database. password: The password for the accessing the database. In addition to this, each driver allows you to specify additional properties. Again, these properties are specific to the database and (hopefully) documented in the manual. Most databases alternatively allow you to encode the properties onto the URL. Within the report designer, there is no user interface to define the JNDI connections. The connections are defined in a file called "$HOME/.pentaho/simple-jndi/default.properties". # Copyright 2008 Pentaho Corporation. All rights reserved. # BI Platform. The Initial Developer is Pentaho Corporation. # Software distributed under the Mozilla Public License is distributed on an "AS IS"
# the license for the specific language governing your rights and limitations. The JDNI definition file holds all connections known to the local JNDI system. This system has no connection to the BI-Server and does not access any connections defined in the Pentaho Administration Console. The simplest way of creating a new definition entry is to copy an existing connection entry and to alter the name of the entry (the first part of the properties) and then to replace the connection information with your own details. All JNDI connection names are case sensitive, so inside the report you have to use the same spelling for the name as in this properties-file. And last but not least: Defining your connection information in the JNDI system does not relieve you from providing suitable database drivers. You can install new drivers by copying the jar files (and if needed any native libraries) into the “lib/jndi” directory of the Pentaho Report Designer. Redefining a JNDI connection requires you to redeploy or restart the application. This is a nightmare for a mission critical server. Each server system comes with its own way to define JNDI definitions. Each of these ways is inherently incompatible with any other vendor. You are bound to the implementations provided by the server vendor. There is little hope to customize the database access for additional capabilities like security checks or multi-tenancy. To define the connection, start the Pentaho Administration Console. The console starts up on port 8099, and can be reached via the URL “http://localhost:8099/”. The user and password are “admin” and “password” (sadly not documented anywhere in the download). The console can only be run successfully if the BI-Server is up and running as well. To define a datasource, activate the “Administration” mode on the left hand side of the window and switch to the “DataSources” tab. Hit the small white “+” to add a connection. The Pentaho Administration Console is smart enough to detect all installed drivers. If your driver is not listed here, you probably have forgotten to add it to the “lib” directories outlined above. The data-source names you define here must match the datasource names defined for the Pentaho Report Designer. I also heavily recommend that you use the same type of database system for designing reports and for running them in production. SQL is a widely interpretable standard and therefore SQL written for one database is not necessarily compatible with the SQL dialect understood by the others. Let me close with: Death to all hard-coded settings, long lives the host provided setting! This entry was posted in Basic Topic on August 1, 2011 by Thomas. Barcodes are a easy way to convey information in a machine readable way. With Pentaho Reporting, you can print a large set of barcodes in your reports. 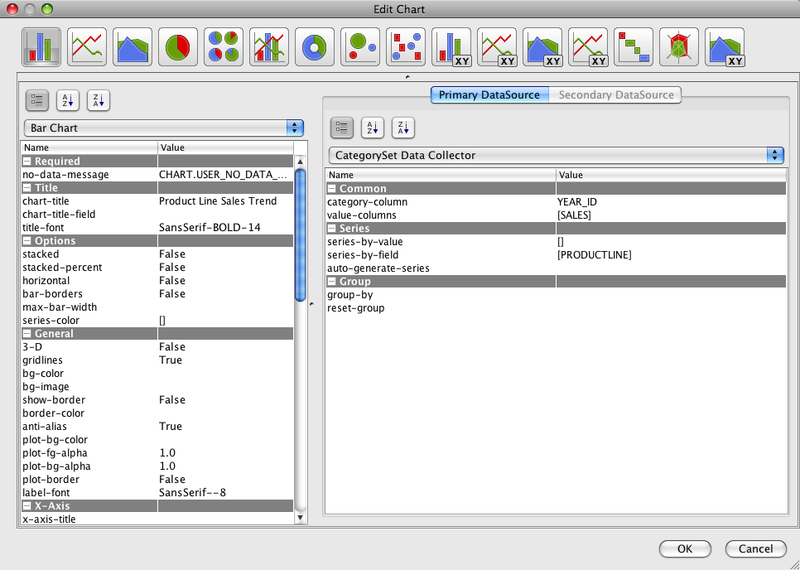 Barcodes in Pentaho Reporting are provided by the “simple-barcodes” element. And creating barcodes is as simple as the name of this element promises. Think of a barcode element as some sort of fancy text- or number-field. A barcode element prints a single field value and generates a barcode vector image for it. To add a barcode to your report, all you need to do is drag the barcode element from the palette on the left-hand side of the window into the report canvas. Each barcode has its range of allowed characters. The barcodes EAN, UPCA, ISBN, 2of5 and PostNet only accept numbers. The Code39, Code128 and Codabar barcodes accept a limited set of characters (the letters A-Z, 0-9 and a more or less extensive set of extra characters, all from the lower 128 characters of the ASCII-Charset). And some are free to accept nearly everything as input (PDF-417 and DataMatrix). Usually, when you print barcodes, your data should already be in a format that can be handled by the barcode you are going to use. All barcoded data is generated by machines for other machines, and the person who generated the data usually (or hopefully) knows the accepted format already. Like ordinary text-fields, barcode elements either receive a static text in the “value” attribute or a field-name in the “field” attribute. If the barcode support printing a textual representation of the data, you can enable this via the “barcode-settings::show-text” attribute. This is also the place to fine tune the bar-width or height or to enable the calculation of checksums for the data given. Styling the elements is easy. Like the “Sparkline Elements”, barcodes reuse many of the existing style properties. text-color: The foreground colour of the barcode. This is the colour the bars are rendered with. background-color: The background colour of the barcode. The barcode area will be filled with that colour prior to printing the barcode. This is handy to ensure that the barcode is printed on a white background for maximum contrast. font-family, font-size, bold, italics: The text properties define the style and size of the text printed on the barcode. Not all barcodes use text. scale: Whether the barcode is scaled according to the element’s size. Some barcodes do not have an intrinsic size and therefore are always scaled. keep-aspect-ratio: If the barcode is scaled, this defines whether the ratio between the width and the height remains constant. For some barcodes, this is mandatory to ensure that the code can be scanned properly. And that’s it. As said: There is no big secret to using barcodes. So happy coding! This entry was posted in Basic Topic on July 25, 2011 by Thomas. Sparklines are a great way to convey a lot of information in a simple and readable way. Sparklines can be used to plot changes of metrics over time. Edward Tufte uses temperatures of patients in a hospital and share prices as examples. Bart Maertens wrote about sparklines when Pentaho Reporting 3.5 came out. At that time, he had to do a lot of SQL magic to get data into them. With the addition of the MULTIVALUEQUERY formula function in Pentaho Reporting 3.8, this process got a lot easier. Pentaho Reporting comes with three Sparkline type elements. Sparkline elements are minimalistic, they do not have any axis labels or legends. Line Sparks: A small line chart that shows the change of values over time. Line charts are good to visualize trends over time. The last data point can be highlighted for better readability. Bar Sparks: A small bar chart that allows to compare absolute values over a time scale. Bar charts should be used when you need to concentrate on the ratio between values instead of the general trends. Pie Sparks: A small pie chart that visualizes a single value in relation to a total value. 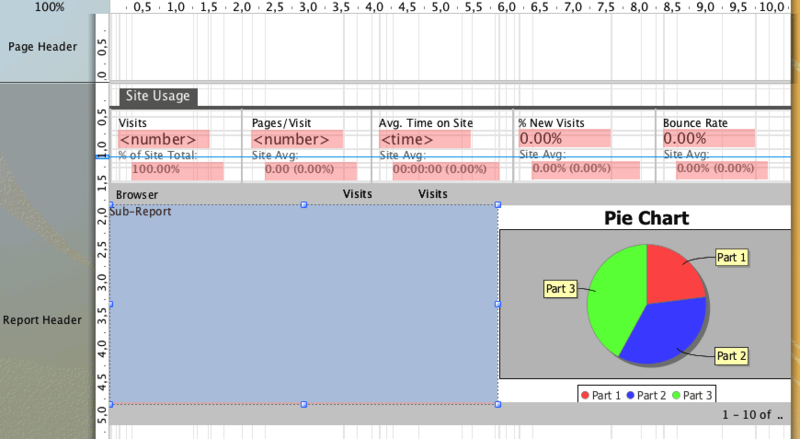 Now how do you add sparklines to a report created with the Pentaho Report Designer? The NORMALIZEARRAY formula function converts a internal OpenFormula array into a valid Java-Array that can be used by other components. Alternatively, you can get a array of values from a data-source by using the “MULTIVALUEQUERY” formula function. You can then reference this data from a formula with the MULTIVALUEQUERY formula function. Pie sparks simply require a single value in the range of 0 (zero) to 1 (one). Zero represents an empty pie (0% of the total), 0.5 a pie filled to the half (50% of the total), and 1 represents a fully filled pie (100% of the total). Sparklines get formatted via the styles properties. high-color: The color of the bar with the largest value. low-color: The color of the slice if the value is below the “low-slice” threshold. medium-color: The color of the slice if the value is below the “medium-slice” threshold. high-color: The color of the slice if the value is below the “high-slice” threshold. text-color: The color of the pie that is not filled by the slice. This entry was posted in Basic Topic, Tech-Tips on July 13, 2011 by Thomas. Today lets talk about you can format report elements and what options our Pentaho Report Designer offers you. Elements can be grouped into two classes. Text elements transform data into a textual representation. Labels, String-Fields, Message-Fields and Number- and Date-Fields are examples of these fields. Graphical elements produce a image to display the data. Charts, Sparklines or Image-Fields are examples for this class of elements. 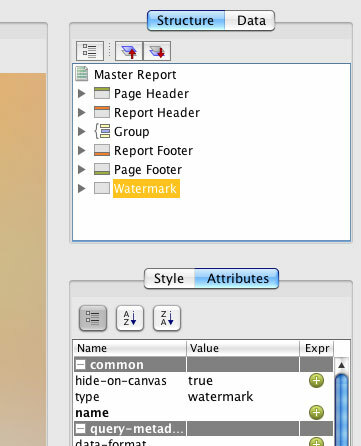 A report element in Pentaho Reporting consists of style information and attributes. Most styles and attributes can be provided either statically or can be calculated by a function. The static properties are called “design time properties”. The calculated properties are called “runtime properties”. Attributes control the element’s behaviour and how data is processed for displaying in the element. Examples for this are format-strings, rich-text processing and so on. Style properties control the visual appearance of the data printed. With the Pentaho Report Designer you will find many formatting options that you can find in other text processor or graphical programs. visible: Defines whether a element is shown on the final print out. Visibility is mostly used as runtime property instead of being specified at design time. min-width, min-height: The width and height of an element define how much space a element takes on the paper. It also controls how many lines of text can be printed and how many characters fit onto each line. The size is either given in percentages (of the width and/or height of the element) or in points (1/72th of inches). x, y: The position of the element if placed into a canvas element. The position is either given in percentages (of the width and/or height of the element) or in points (1/72th of inches). dynamic-height: Dynamic height is a flag you can set to let the element expand its height to match the content you attempt to print. padding: Padding allows you to insert some space between the edge of the element (where the borders sit) and the content printed in the element. The padding size is given in points (1/72th of inches). text-color, background-color: Defines the element’s foreground and background colours. For text elements, the most common style you are going to change is probably the font properties. font-name: Defines the font name. The font must be available, or a default font is used instead. This is especially important if you intend to publish the report to a server, which may not have the same fonts as you installed. font-size: Padding allows you to insert some space between the edge of the element (where the borders sit) and the content printed in the element. embedded: This flag is only useful for PDF exports. It controls whether the font is embedded into the PDF document. Only TTF-fonts can be embedded and not all fonts allow you to embed them. h-align, v-align: Positions the text within the element. Graphical elements have different properties based on what sort of element you are dealing with. : Defines the stroke that is used to draw the outline of the shape. field: The name of the field from the reporting engine reads the value. If a value is given in the “value” attribute, that static value will be used and the field will be ignored. if-null: A static value that is printed if the field would evaluate to otherwise. data-format: A flag that defines whether the element will update its format string from the meta-data given by the data source. style-format: A flag that defines whether the element will update its style properties from the meta-data given by the data source. show-changes: If this flag is set to true, the element will only print if the value has changed from the previous value. The element will always print if it is the first element in the group or on the page. format: Defines the format string. To make number fields align correctly, ensure that your format specifies a fixed set of decimals in the format string and that you right-align the field in the style options. This entry was posted in Basic Topic, Report Designer & Engine, Tech-Tips on June 7, 2011 by Thomas.